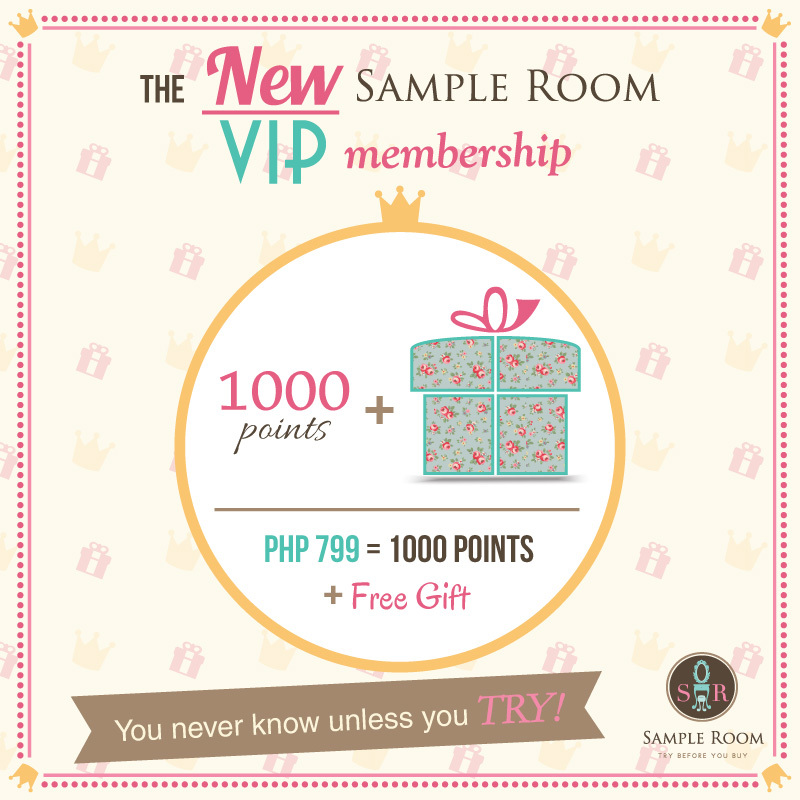 Sample Room, the Philippines’ First Beauty & Lifestyle Sampling Website Revamps VIP Membership! Sample Room, the Philippines' first beauty and lifestyle sampling website, has been giving Filipinos the ultimate value for money, with their "try before you buy" concept. By being a member of Sample Room, you get to grab the latest beauty and lifestyle samples that you can also place a review of after trying them. With Sample Room, we give you the perks of getting to try the latest brands and products in the market! Simply sign up and get 100 free points upon registration. With 100 free points, use your points to grab your desired samples, and upon checkout and payment of a minimal shipping and handling fee, you get your set of samples delivered to your doorstep. As you enjoy your experience trying out the samples, you are requested to review the products you have sampled, and with that, you get your points back and you get to have a chance to grab new samples again! Sample Room's New and Improved VIP Membership: You'll Never Know Unless You Try! As Sample Room is turning two years old soon, things just keep getting better with new offerings and treats for Sample Room members. This October, Sample Room launches a new-and-improved VIP membership system. Previously, Sample Room's VIP membership gives you 1,000 free points that can be used for two months to avail of premium samples, for just 699php. This October, Sample Room ups the amp to give its VIP members an absolute treat! For P 799.00, aside from the 1,000 free points, VIP members get a surprise goodie package every time they sign up for VIP membership. VIP Membership with Sample Room gives you the freedom to choose any sample you want, and to be able to avail our exclusive, limited premium samples. Get 1,000 free points reusable within two months for only P799.00, and get samples with a total value of more than P799 value every month by simply availing our sample selections! With Sample Room's new and improved VIP membership, aside from having the freedom to grab all types of samples in our website, you get a surprise package, that is shipped to you for free every time when you sign up and renew for your VIP membership. Be surprised and delighted with our carefully curated package just because we want to give you the best sampling experience! 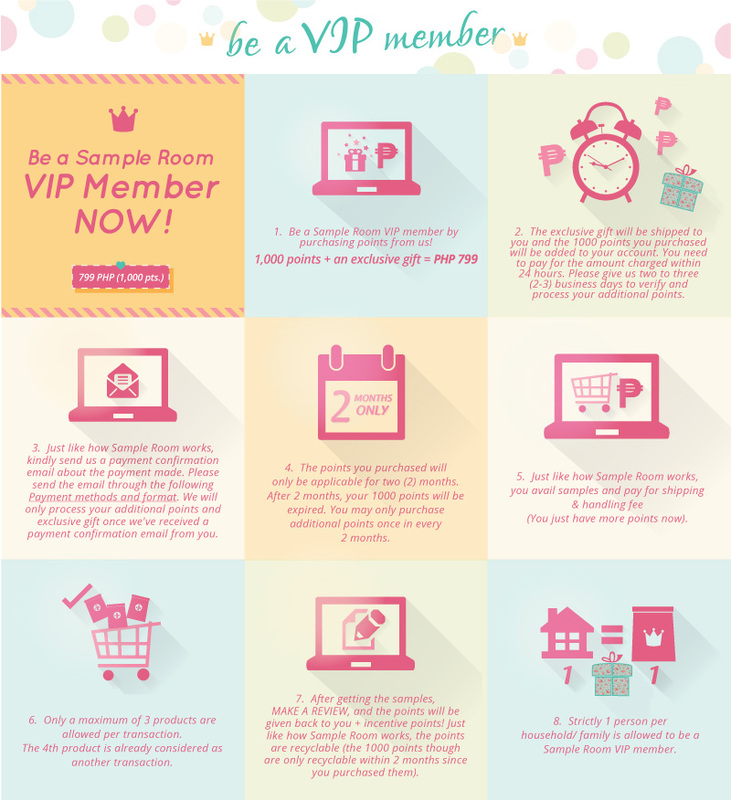 You may avail of Sample Room's NEW and Improved VIP membership HERE! Avail of Sample Room's NEW and Improved VIP membership HERE!